At first glance, this is a well researched series about an order of medieval assassin nuns sired by Death Himself, so I was pretty much already sold. But THEN I started reading it, and could not stop. For weeks. I burned through all 3 books (and the related upcoming February 2019 release Courting Darkness) in like a week and a half. The series takes place in 15th century Brittany, a time when everyone is at war, the duchy has been inherited by a 12 year old girl, and the Catholic Church chose to actively subsume pagan beliefs in order to gain acceptance among a reluctant populace. It is one of these old pagan gods, Mortain, now considered the patron saint of death, that our heroines worship and struggle and fight for. But they are also fighting for themselves. The history is fascinating, the trauma is brutal but very well handled, the romance is the healthy and supportive (but fuuun) kind that you want your teens reading about, and the weapons are historically accurate. Don't you want to read about young women finding self actualization and liberation through violence and subterfuge and epic battles? DON'T YOU? 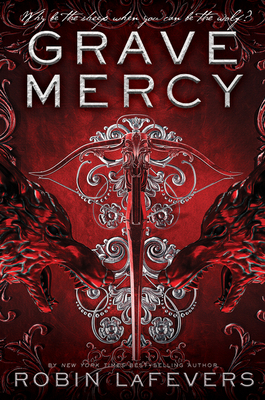 Trained by a convent of assassins under Death's employ, Ismae learns the many ways of anger management. Alternative history with fantastic costumes, intrigue, betrayal, and a satisfying conclusion (in that I proceeded to read the rest of the series right after). Excellent! "A delectable simmer of intrigue and ferocity, passion and compassion. Grave Mercy sates and fascinates, even as it leaves you craving more." "Chilling, deftly plotted, and with a thread of subtly crafted romance. Readers will be seduced by LaFevers's deadly snare of haunting magic and courtly intrigue." "Prepare to enjoy LaFevers' tasty court intrigue and one badass heroine." * "With characters that will inspire the imagination, a plot that nods to history while defying accuracy, and a love story that promises more in the second book, this is sure to attract feminist readers and romantics alike." * "LaFevers' ambitious tapestry includes poison and treason and murder, valor and honor and slow love, suspense and sexuality and mercy. A page-turner-with grace." * "Rich in historical detail, well-realized characters, political machinations, and enticingly prickly scenes between Ismae and Duval, LaFevers's complex tale incorporates magic both sparingly and subtly. This powerful first volume of the His Fair Assassin series should attract many readers." * "The book is well written and filled with fascinating, complex characters who function realistically in this invented medieval world."